Old sewing machine - Willcox and Gibbs. 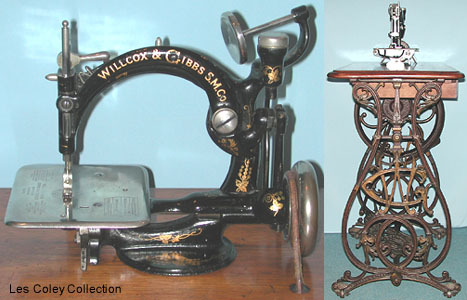 Known to every collector, the Willcox & Gibbs is arguably the most successful chain stitch machine of all time. The earliest models originate from the late 1850s, but examples such as the one illustrated date from the mid 1870s onwards. This is evident from noting the automatic thread tension device, which appeared at that juncture. Production continued until approximately 1940. It was Gibbs who patented the rotating hook which forms the stitch - the same principle used on most chain stitch models to this day. The machine was available in various guises - handcrank, treadle, and latterly, motor powered. Examples can be considered historically significant, but common due to the very large numbers produced.